It’s the time for Spring, my birthday, and MARCH MADNESS!!!! March Madness is super fun, even if you’re not a college basketball fan. The key is to do a bracket to help make the 64 games more exciting. 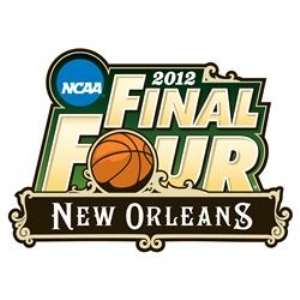 This year, I am the Commissioner of a bracket pool. A small group of family and friends participated. Even Mo got in on the action. We have all been glued to the tv. There’s no cash money or prize involved, just bragging rights. Maybe I should have taken some pointers from 11 year old Omaha 5th grader, Max Kohll. Max was running a NCAA Bracket pool at his school. He was charging his buddies 5 bucks to enter. Winner gets half the pot, and second and third split the rest. However, Columbian Elementary Principal Kathy Nelson had a different plan. Principal Nelson let him off with a stern talk and a promise never to do it again. Later, she came to his classroom and lectured his class. Principal Nelson also called Max’s mom, Janet Kohll, a stay-at-home mom of 5 children. 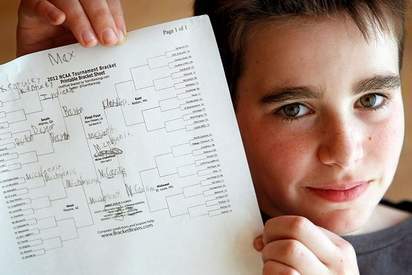 Janet was already aware of the ingenius bracket pool, since she loaned her son his $5 entry fee to get it started. So, her bookie son ceased the school pool and joined in the family bracket pool. I admire the blossoming entrepreneur. Afterall, I’m a mom whose son has organized a candy shop, LEGO toy ring, soccer team, and yard sale. I get it though, no gambling in school. As Yahoo’s Prep Rally blog points out, all office pools that collect money and offer payouts to winners are technically illegal. It’s considered unsanctioned sports gambling. However, I think the most serious offense that needs to be addressed and punished to the utmost is the fact that this kid chose UNC to win it all. What? It’s Michigan State all the way baaaaby! I was in my dad’s pool at that age, but I was never running my own!